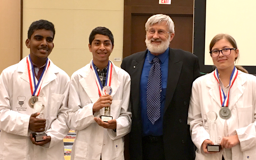 Future neuroscientists from around the world met in Washington, DC this week to compete in the nineteenth World Brain Bee Championship, with the 2017 World Brain Bee Champion announced as Sojas Wagle, a sophomore from Har-Ber High School in Arkansas, USA. The Brain Bee is a neuroscience competition for young students, 13 to 19 years of age. This year it was hosted by the American Psychological Association. Second Place went to Milena Malcharek of August Witkowski High School in Cracow, Poland. Third Place went to Elwin Raj A/L P. Raj Vethamuthu from Sbpi Gopeng High School in Malaysia. Germany and Israel tied for fourth place, and Iran came in fifth. Sixth through tenth places went to Grenada, Canada, New Zealand, Australia and Korea. While in the US, twelve DC Ambassadors invited their respective national champions to visit their embassies to be honored, including India, Kenya, Egypt, Ukraine, Korea, Israel, Italy, Malaysia, Singapore, Japan, Australia, Poland and Germany. The Brain Bee involves more than knowledge; it involves relationships. It is an instrument of peace. The friendships and mutual respect developed during the Brain Bee will last a lifetime. Read more about the Brain Bee online.